It's a small island--maybe 30 miles across on its longer, east-west dimension. It was mostly swamp when the Sultan of Johor in 1819 ceded it to the East India Company in the person of Stamford Raffles. 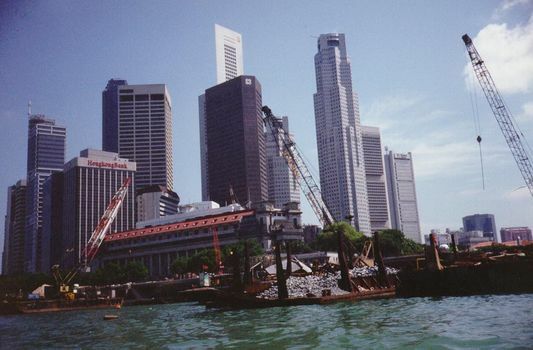 Within five years, Singapore had risen from a fishing village of 150 people to a free port and trading center of 10,000. The British finally left in the 1950s, and after a brief, unhappy marriage with Malaya Singapore became an independent nation in 1963. Since then, there's been no looking back. 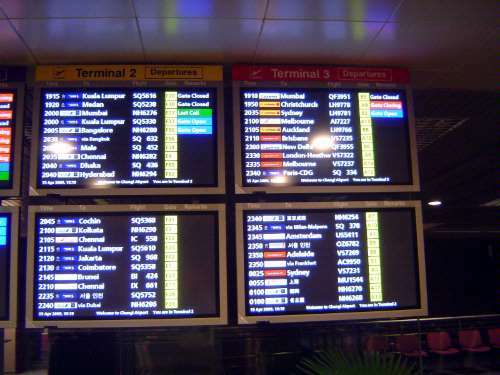 Departures at Singapore Changi: Malaysia, India, Bangladesh, Australia, New Zealand, France, the Netherlands, and more. 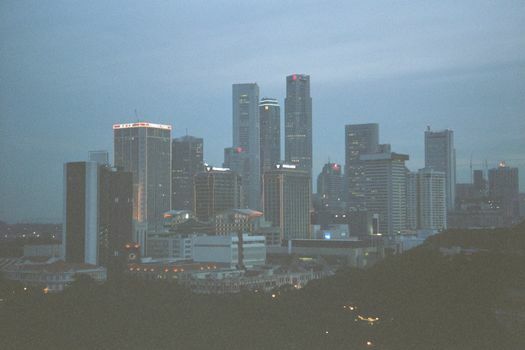 The upshot: downtown at dusk, January 2001. That's a densely forested park in the foreground. 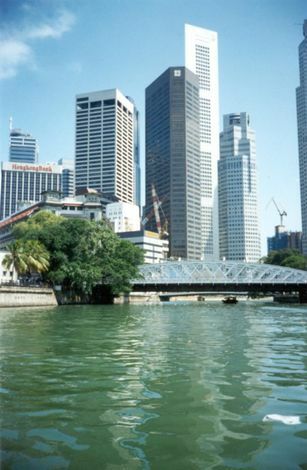 The Singapore River winds just this side of the tallest towers, preeminently the Overseas Chinese Banking Corporation (OCBC) and United Overseas Bank (UOB). Thirty years ago, the river's right bank was lined with two-story shophouses; now it's lined with Maybank (Malaysia), Standard and Chartered, the Bank of China, the UOB, and the OCBC. They all stand on what Raffles had designated as part of the "Chinese campong." A bit farther out. 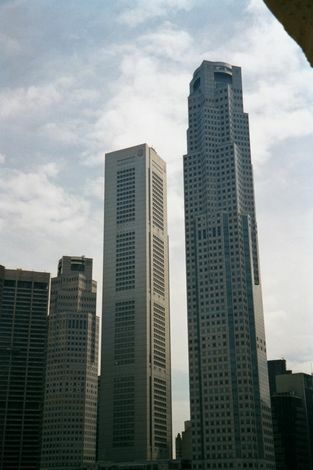 The foreground building was opened in 1928 as the general post office; in 2001 it reopened as the very high-end Fullerton Hotel. Tourist Central: that's the octagonal Marriott (formerly, Dynasty) Hotel on Orchard Road, which takes its name perhaps from the nutmeg plantations established here in the 19th century but partly also from a Mr. Orchard, who lived here. 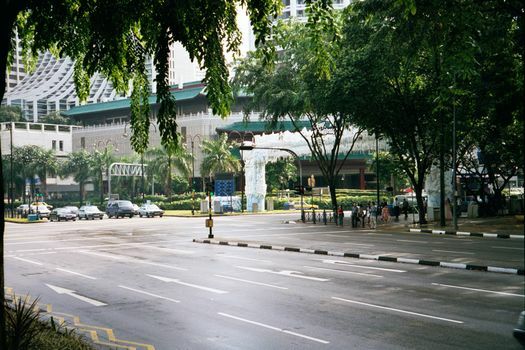 Victor Savage and Brenda Yeoh write in Toponymics: A Study of Singapore Street Names (2003), that in 1900 Orchard Road was "a well-shaded avenue" reminiscent of "Devonshire lanes." The same leafy corner, from ground level. The trees are no accident. 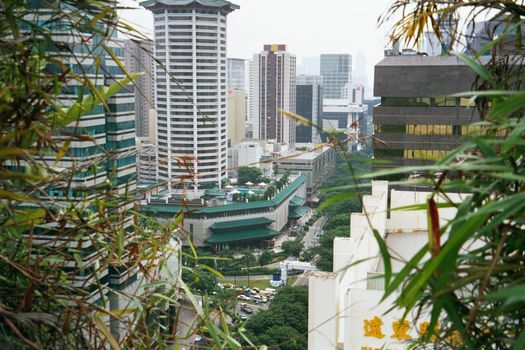 Here's President Lee Kuan Yew, in 1980: "Singapore can become a green, shady city filled with fruits and flowers; a city worthy of an industrious people whose quest for progress is matched by their appreciation for the beauty of nature." 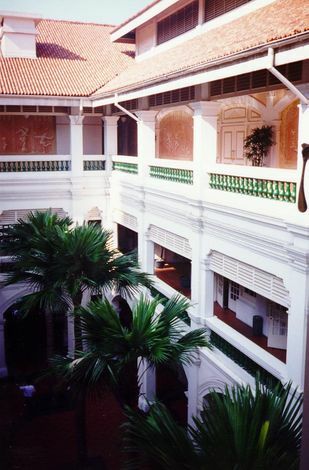 A courtyard at the Raffles Hotel. In the mid-1980s, plugging a radio into the wall unleashed a cloud of sparks and a small but dramatic fire. Investors might have knocked the place down; instead, they embarked on a massive renovation project. Today, sparks fly only when guests get their bills. In the 1930s, Singapore had a population of about 600,000 people. 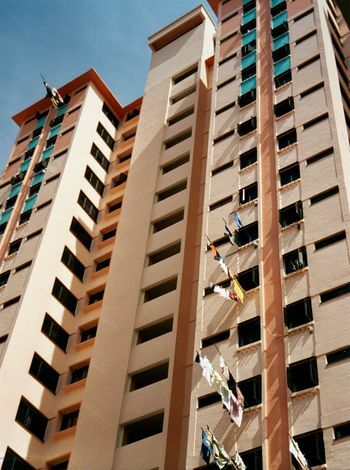 Most lived in kampongs or villages that planners described as squalid and fetid. 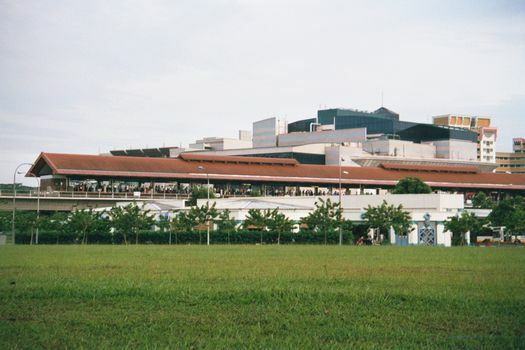 A sixth of all the deaths in Singapore in those days came from tuberculosis. Little was done until 1960, when a massive program of public housing began. 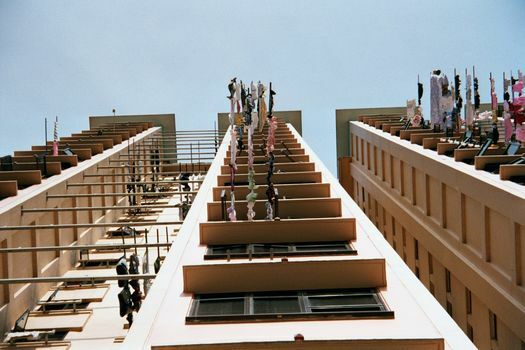 Today, about 85% of Singapore's 3,000,000 people live in apartments built by the government over the last 40 years. 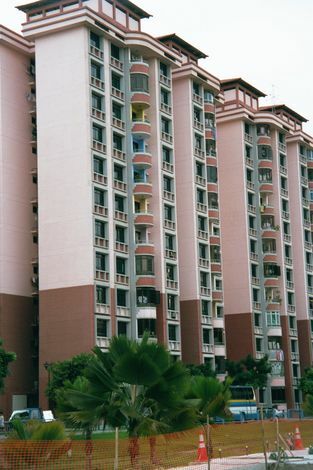 The quality of those apartments has risen steadily over the years. Here's an early version. 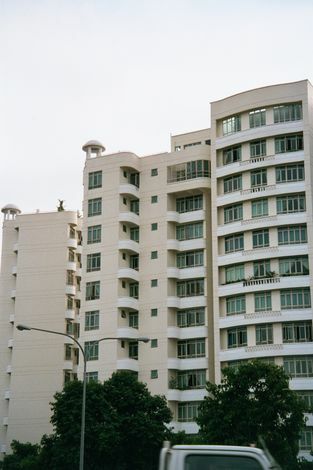 Between 1947 and 1959, 21,000 housing units were built by the government, particularly in the neighborhoods of Alexandra and Queenstown. Then a Master Plan was undertaken. It was finished in 1955 and adopted in 1959. By 1970 120,000 units had been built. To do that, 37,000 squatters had been moved. 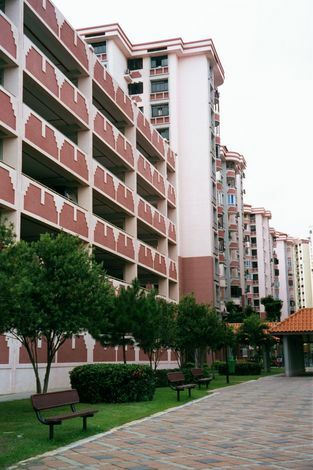 Between 1970 and 1983, another 75,000 were relocated at a cost of S$800 million. They received S$27 per house, S$20-40 per coconut tree, and S$740 per hectare of vegetables. Those numbers may seem low, but a Land Acquisition Act of 1966 that permitted compulsory acquisition of land needed for any public purpose stipulated that compensation should be calculated without regard to the development value of the land. The scale of things grew large--by most accounts, too large. Here's an example from Chinatown, near People's Park. 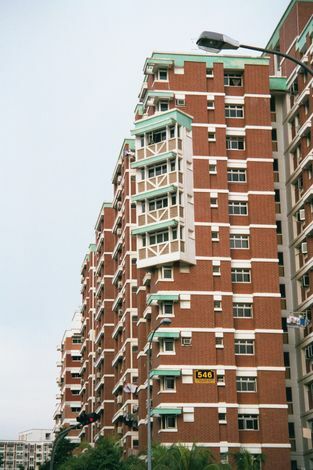 A Home Ownership Scheme in 1964 began encouraging purchase of the apartments. 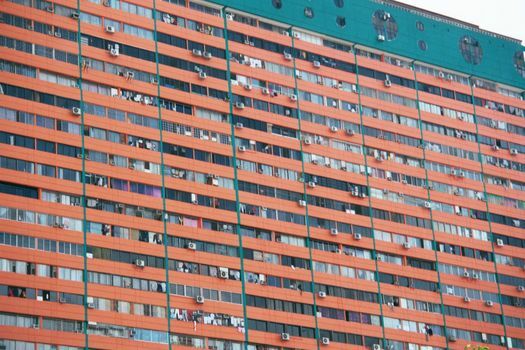 Apartments grew larger, too: in 1971, for example, 5-room apartments were introduced. New towns were established, in part on the 44 percent of the island's land that the government already owned--an inheritance from the British. 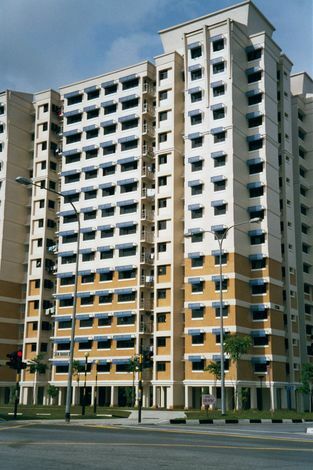 Some of the new towns were large: Clementi, Bedok, and Woodlands, for example,each had housing for 200,000 people. Rather than create Stalinesque monstrosities, the government began experimenting in the 1980s with pitched roofs, overhanging eaves, and tall windows. The results don't compare with the luxurious private housing in neighborhoods like Bukit Timah or Katon, but they're impressive. 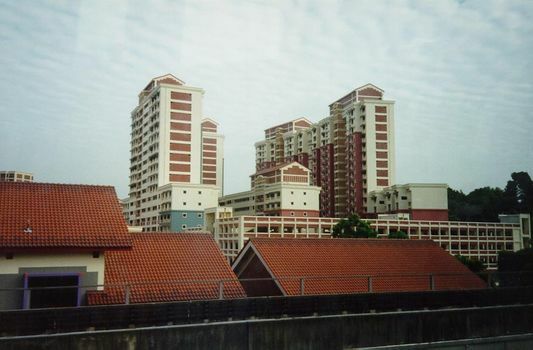 Here, starting with this picture, is a tour at Boon Lay, near the industrial center of Jurong, at the southwest corner of the island. 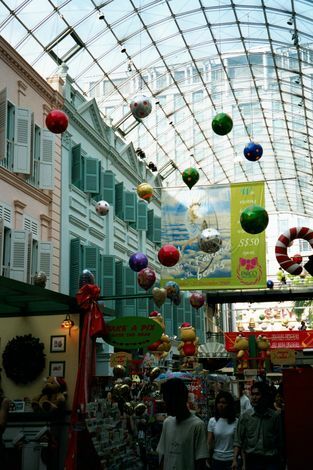 There are comparable centers at Woodlands, Tampines, and Seletar. At least you can find your building. 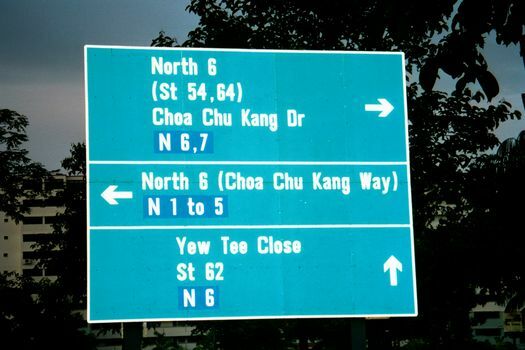 Choa Chu Kang, south of Woodlands and in the north-central part of the island. Just a reminder: don't rent a car in Singapore and go wandering around these neighborhoods at night. It's easier to drive in Cairo or Istanbul than to get out of these cul-de-sacs and loops. The roadsigns are intended to help, but they don't. Singapore in any case actively discourages motorists. Among the tools at its disposal: license fees and parking restrictions. The subway is the way to go--and the way the planners keep traffic moving. Here, a subway station, above ground outside the central city. Short walk from apartment to station. Residents have access to shopping that can't be matched within many thousands of miles. 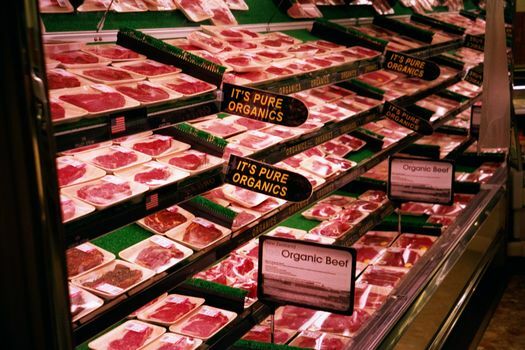 How's this: a meat department with nothing but organic beef. A mall adjoining the Intercontinental Hotel. 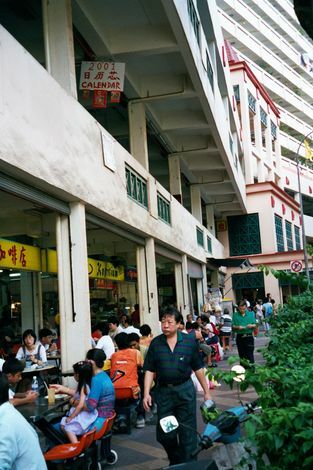 A street of shophouses has been conserved and roofed over. Leisure? 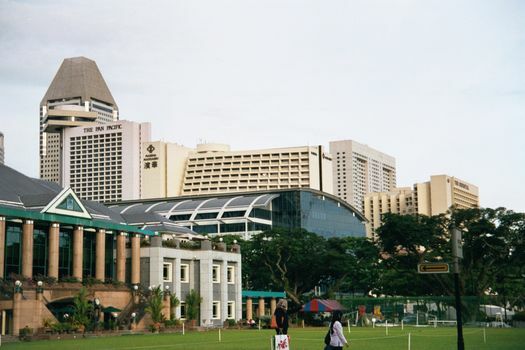 Here's a bit of the Singapore Cricket Club, which is backed up by a string of hotels along the marina. Want something less glitzy? This is in Chinatown, near People's Park. It's got to rank among the world's biggest fast-food complexes, and the vendors are all independents. 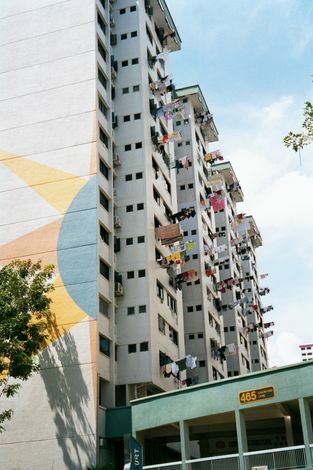 A block or two away, an older generation of public housing has been upgraded into pastel-central. 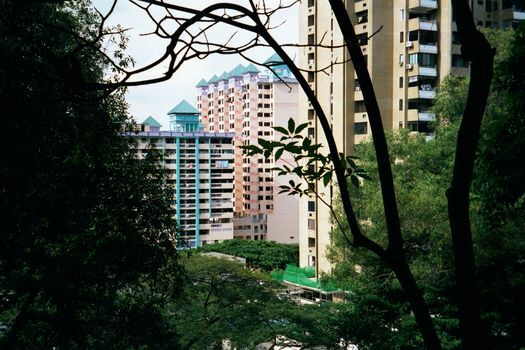 The trees are part of Outram Park.